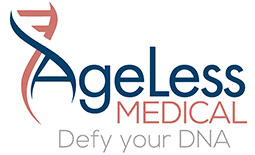 Jackie is the Office Manager and Patient Care Coordinator for AgeLess Medical. She will be your first point of contact as she walks you through the consultation process, providing concierge style patient care and post treatment satisfaction. With her B.S. in Business Marketing from the University of Wyoming and extensive experience in the health and medical industry, this position is the perfect fit for Jackie. It allows her to use her background of anatomy and physiology in combination with her fascination for medicine and passion for patient care. Jackie recently segued into the world of plastic and aesthetic medicine, discovering a new venue in which she could help people feel their best, this time from the outside in. She previously worked as a Surgical and Patient Care Coordinator for a top Plastic Surgeon in Denver, CO, educating and advising patients in achieving their personal and aesthetic goals. Jackie believes that by using advanced cosmetic injectables, non-surgical treatments, and medical grade skincare solutions, patients can achieve their aesthetic goals and ensure that their aging process is both graceful and seamless. Outside of the office, Jackie loves traveling, being active, and cheering on her fellow University of Wyoming Cowboys. With nearly 10 years’ experience as an Esthetician, Rachael continues to pursue her passion of transforming skin one client at a time. Her goal is to achieve an entirely new level of service and results to her clientele who simply deserve the best from their skin and skin care experiences. Rachael graduated from College of International Esthetics (Arvada, CO) in 2009 and earned her Esthetic License with Certifications in Chemical Peels, Microdermabrasion, and Permanent Cosmetic and Pigmentation. She continued to advance her Esthetic knowledge and skills at Cheeks Beauty Academy (Cheyenne, Wyoming) where she received her full Cosmetology License in 2013. Rachael’s desire for more medical-based knowledge lead her to Laramie Country Community College in 2015 (Cheyenne, WY) and she achieved her Certification as a Medical Assistant. While she enjoyed working in the medical side of health, her keen skills set, extensive knowledge, and love as an Esthetician was undeniable and she continued her Esthetic education journey. She attended the World Microblading Academy (Santa Monica, CA) in 2017 and earned her Microblading Certification with her most recent certification in Dermaplanning from Colorado Advanced Esthetics (Centennial, CO) in 2018. Since no two complexions are the same, Rachael thoughtfully customizes each session and is inspired by cutting edge skincare innovations to make flawless skin attainable on a daily basis. She relentlessly researches and incorporates the latest techniques, products, and treatments to ensure the best possible results for everyone. Her trademark is immediate, undeniable results with long-term benefits.